You probably heard that ULink, the latest extension of Link Light Rail, opened last weekend. It extends the Sea-Tac / Downtown Seattle line to Capitol Hill and the University of Washington. It represents a major milestone in bringing 21st century mass transit to Seattle, but many people we've spoken to don't realize it's impact on Pioneer Square and other neighborhoods along the line. We jumped at the chance to ride the new line on opening day and were thoroughly impressed. Not only were the stations beautiful and the trains bustling with energy and excitement, the ride times to Capitol Hill and UW were almost unbelievably short, opening the door for residents and workers of Pioneer Square, Chinatown International District, Capitol Hill, and Montlake to move freely between neighborhoods, for lunchbreaks, shopping, work, and nightlife. For our coworking business, proximity to the light rail line means we can pull coworkers and staff from Rainier Beach, Columbia City, Beacon Hill, Capitol Hill, and University District without ever having the difficult conversation about finding parking in Pioneer Square. Students commuting to UW can live as far south as Rainier Valley and travel to campus in under 30 minutes, without a car! On Saturday, we tested the line to UW and back, stopwatch in hand. Here are the ride times from our closest station. There is a Pioneer Square Station, and an International District Station within walking distance of The Pioneer Collective, but the ID Station is closer, about a 5 minute walk. Early press and Twitter reaction was overwhelmingly positive as well. If the new ULink extension has you excited for the future of transit in Seattle, there are some key organizations and upcoming milestones you should be aware of. First, the Seattle Transit Blog and the hard working folks (and tPC members) at Seattle Subway are the go-to resources for all things transit related in Seattle. Seattle Subway is made up of advocates, engineers, transit geeks, and passionate citizens, working within the system to push Sound Transit to build the interconnected system Seattle missed out on in the late 1960s and in 1912. Seattle Transit Blog is a 501(c)(4) nonprofit organization that covers transit news for the greater Seattle area. Both groups are pushing for ST Complete, their vision for what they call a "once in a lifetime opportuntiy for high capacity transit in Seattle and the Puget Sound Region." This issue will be on your ballot this November. In the meantime, how can you help further the cause? 1. Email the Sound Transit Board and tell them you support going big on ST3, including a Ballard/UW line. 2. Tell your friends about the upcoming ballot measure and volunteer to help Seattle Subway get the word out. 3. Vote to fund the ST3 plan in November! Helpful links and further reading - Want to get caught up with a deep dive into our transit present and future? These links provide a good place to start. South Seattle Light Rail commuter? Check out our Link Coworking Pass for Beacon Hill, Rainier Beach, Columbia City and more! There is no shortage of good places to eat when it comes to lunch in Pioneer Square. In the last couple of years, new restaurants and cafes have seemed to open monthly. Being new to the neighborhood, we still have a lot of exploring to do and have probably overlooked some great options. We have however, come up with five spots we've been been dining at often (in no particular order). 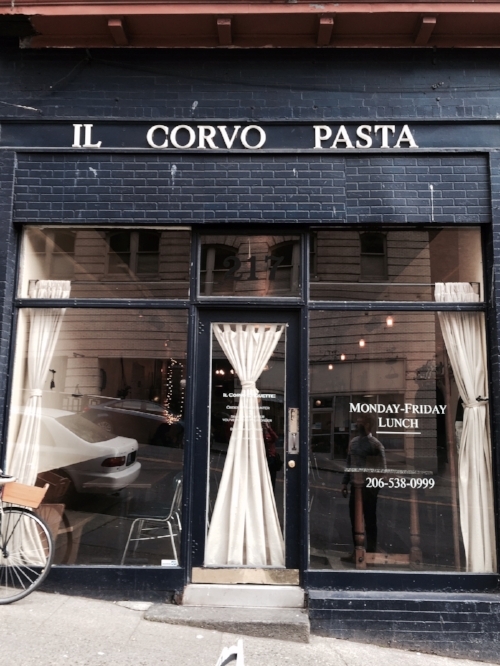 Il Corvo has become my favorite place to grab lunch in Pioneer Square. Nestled between 2nd & 3rd inside a long rectangular space no bigger than 1000 square feet, a lunch at Il Corvo transports you to a European eatery for the afternoon. The beautifully rustic and simple decor will remind you of an Italian farmhouse and the daily fresh pasta will taste just as authentic. This is pasta with few ingredients that manages to pack a lot of complexity. House-made noodles are always cooked perfectly al dente, and the sauces never lack flavor. For anyone who thinks spaghetti and meatballs is bland and boring, these pastas will prove otherwise. Tips: If ordering a döner, I recommend ordering it as a wrap (spinach or whole wheat tortilla option). I prefer the lighter tortilla to the bready fladenbrot they typically serve it in. The Berliner is a good place to get a fresh meal quickly. They specialize in döner kebab style sandwiches and salads. The menu is relatively straightforward, a variety of sandwiches,salads, and wraps offered with your choice of protein. It is hard to find a filling and satisfying lunch salad, but the Berliner provides just that. Portions are generous and you might leave with leftovers. Their kebabs are advertised as hand made in-house, 100% meat (no fillers), no preservatives, and no MSG. The name Berliner comes from the fladenbrot bread of Germany that resembles focaccia, though you can order your sandwich in a pita or a tortilla instead (recommended). Most menu items incorporate the traditional flavors of yogurt, cucumber, tomato, cilantro, and onions. If you don't like these flavors, it will be hard to work around the menu. The service is usually fast though lunch can get busy. With a rather unremarkable and dated interior, the Berliner makes for a great place to order ahead and pick up. Your $7-$9 meal here will certainly satisfy a growling stomach. Cons: Not the biggest bang for your buck. The salads in particular leave you needing something more. Zeitgeist is always a top lunch choice for me no matter the occasion. Whether I'm in the mood to read the paper or browse online while eating solo, or I'm meeting someone for business, Zeitgeist fits the bill. It works at any time of day. Along with quality espresso and tea served throughout the day, Zeitgeist offers great egg sandwiches and pastries at breakfast and tasty baguette sandwiches and salads for lunch. In the late afternoon and into evening you can grab a happy hour beer. The warm wood interior contrasted by the colorful work of local artists' and antique coffee roasting equipment, creates a charming atmosphere that urges you to stay a while. I prefer the sandwiches to the salads for lunch, as they are more filling for the price. The sandwiches are European inspired, typically grilled on a baguette or ciabatta with a variety of high-quality veggie and meat combinations. Served with a simple green salad, they make for a complete lunch in an inspired setting. Cheddar Egg Biscuit: A flaky buttermilk biscuit with a scrambled egg and melted cheddar cheese. The Blue Ribbon Sandwich: thinly sliced roast beef, picked red onions, fresh salad greens, and plenty of blue cheese mayo on a toasted Potato Bun. Cons: Not particularly cheap nor quick for a fast lunch sandwich. Grand Central Bakery's mission is "to serve customers delicious, authentic food made from high-quality local and sustainable ingredients." Founded in Pioneer Square roughly 25 years ago, this bakery is still led by a close community of friends and family who are passionate about artisan baking. This is made clear by the chewy fresh breads their sandwiches are served on. Stop in for lunch and you will find a variety of sandwich options, soup, and salad that can all be complimented by the tasty baked goods and espresso. The sandwiches feel home-made, and with a location in the historic Grand Central Arcade, you will feel right at home. With the ivy-clad brick building exterior, cobble-stoned patio, and interior fireplace, there is no cozier place to meet a friend for lunch. The London Plane, located on the northeast corner of Occidental Park, is the most beautiful lunch spot for a work diversion. You will notice the space just passing by whether you are looking for The London Plane or not. With flowers for sale displayed outside, a classical romantic white-brick interior, and a charming upstairs balcony, The London Plane will draw you in. Whether you've been drawn in during the morning hours or evening, you are sure to find something that will satisfy. With fresh pastries and coffee at the walk-up counter, a sit-down lunch menu featuring toasts, salads, & full plates, and a plated dinner menu, The London Plane does it all. And this is before you add in the gorgeous array of foodie gifts and flowers for sale inside. The dishes at the London Plane are never boring, with exotic flavors that take your palate to Morocco or Spain while dining inside a Paris meets London cafe that seems almost monumental. For the majority of us, The London Plane is not an everyday lunch spot, but on those special occasions, it does not disappoint.